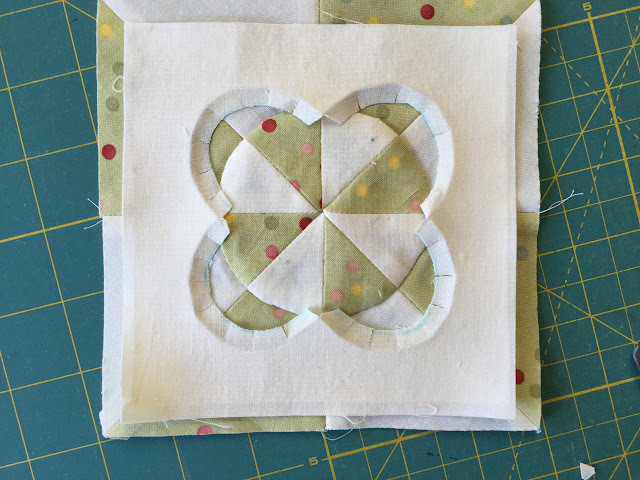 The method to make block B02 is the base to this block. 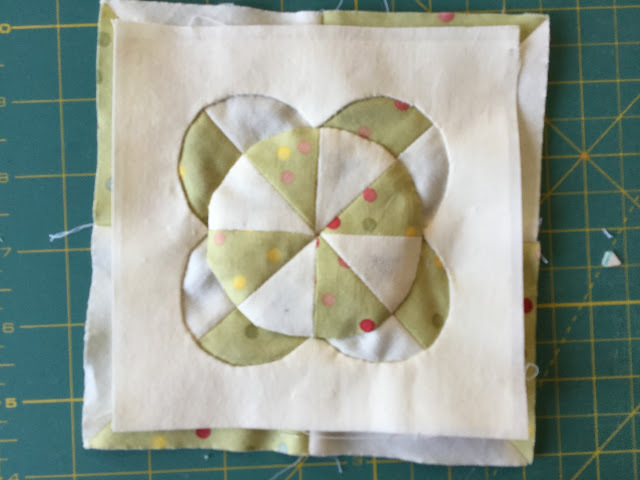 The block is a bit fiddly but it’s not hard to make though appliqué is still a bit of a challenge for me and the curves aren’t very smooth. 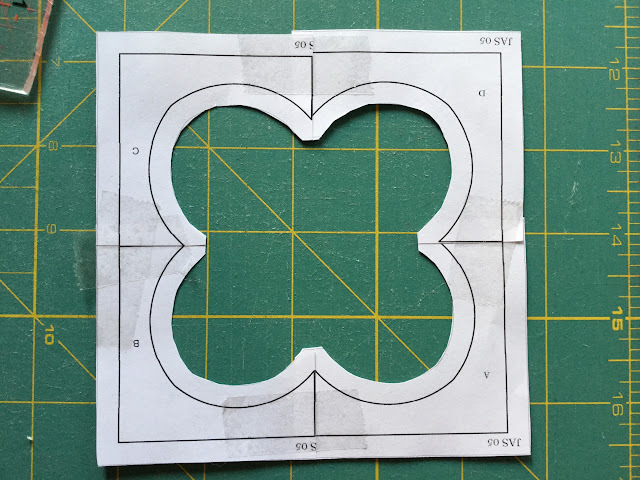 The original block and the instruction ns on the pattern indicate that the outside clover shape should be made out of a 4 patch block but that’s not what I did. 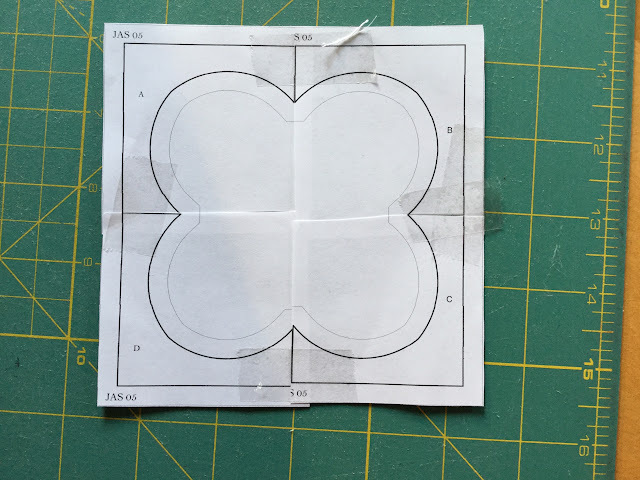 I printed the Susan Gatewood’s pattern and stuck the outside clover together with sticky tape to make a pattern. 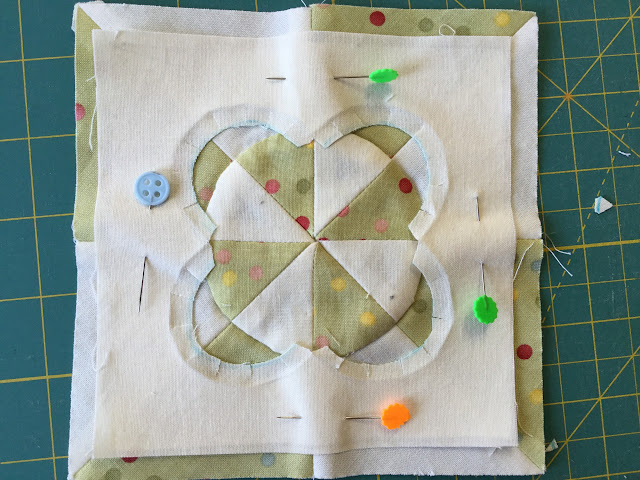 I appliquéd this on top of the double pinwheel at the end. 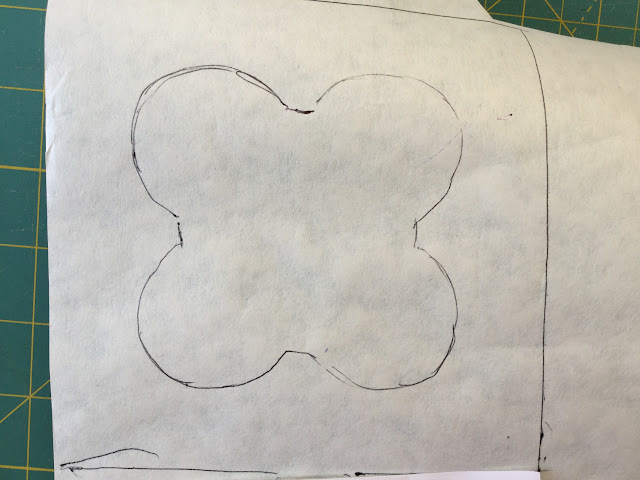 I cut off the paper inside the clover. 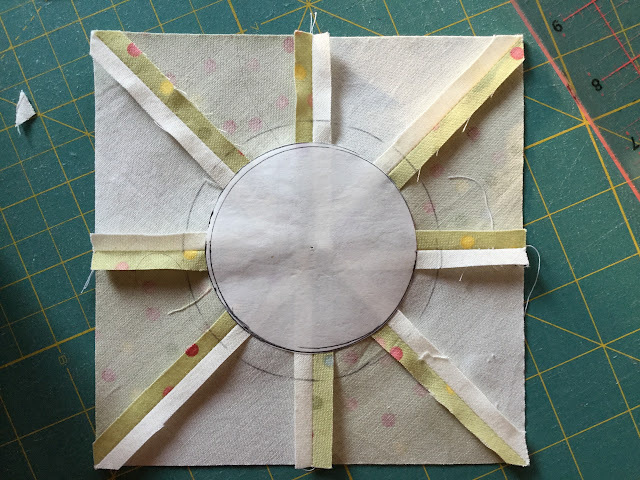 To work out the size of the circle, I used the pattern and a compass. 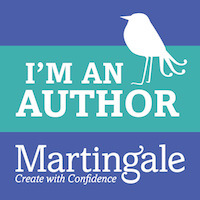 The circle’s diameter is 3 inches. 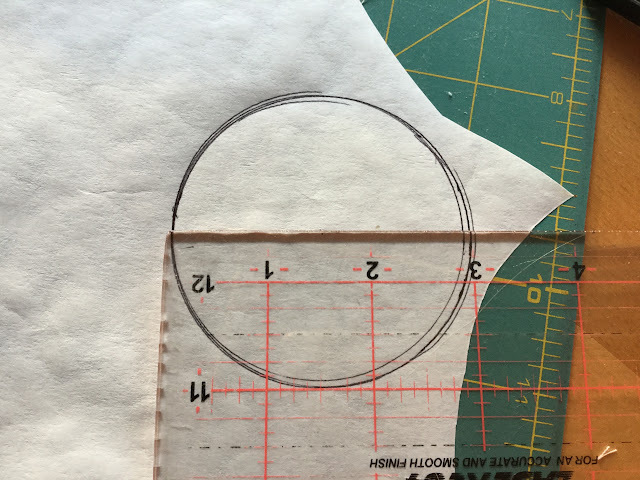 I drew a circle on to freezer paper and cut out. 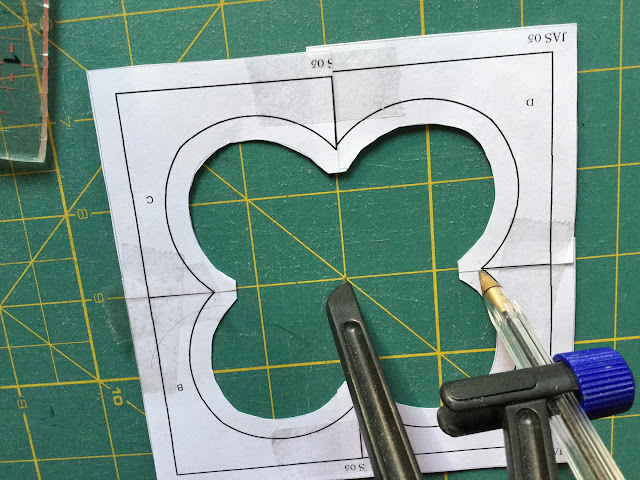 I cut the circle out and made sure it was wide enough to fit into the clover. 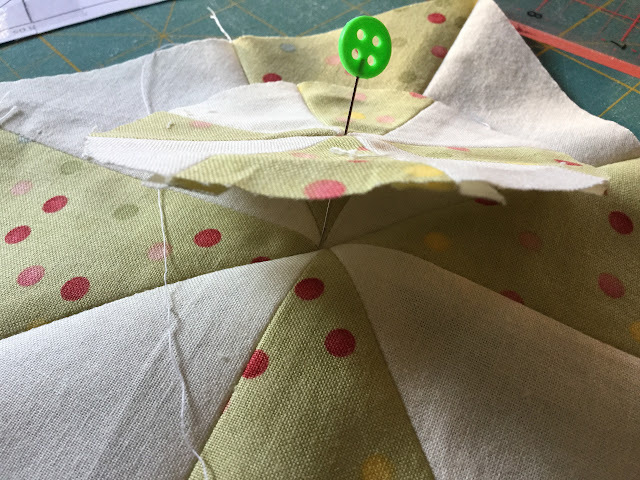 I pressed the circle to the back of one of the pinwheels and drew another circle around adding 1/4 inch seam allowance. 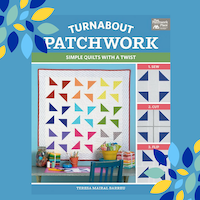 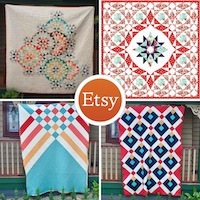 I cut out the shape and placed it on top of the other pinwheel as per picture. 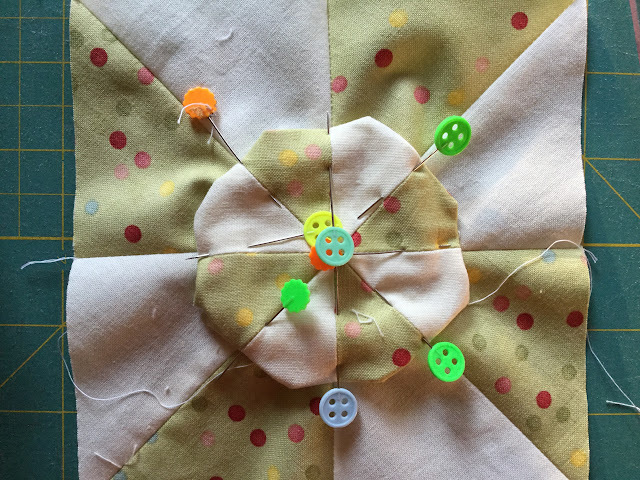 I used a headpin to help aligning the centre on both pinwheels. 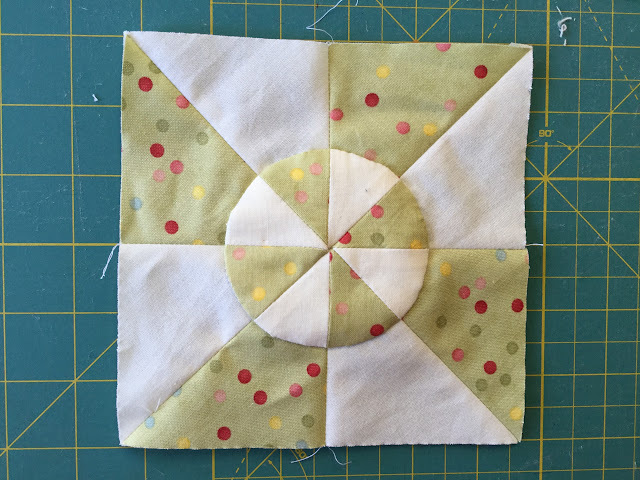 I pinned the circle well before appliquéing. 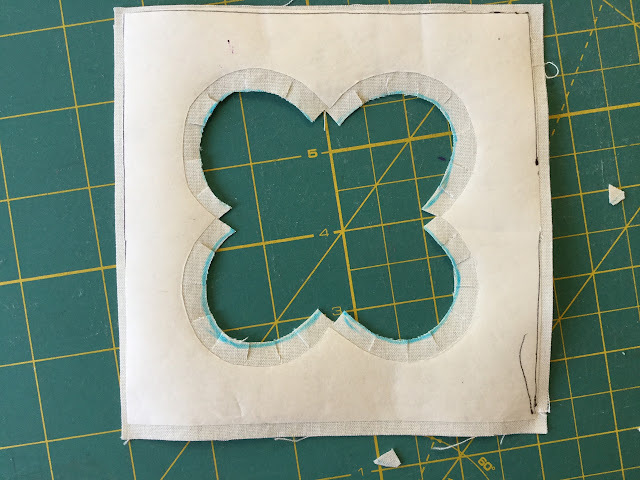 I cut out the excess fabric at the back. 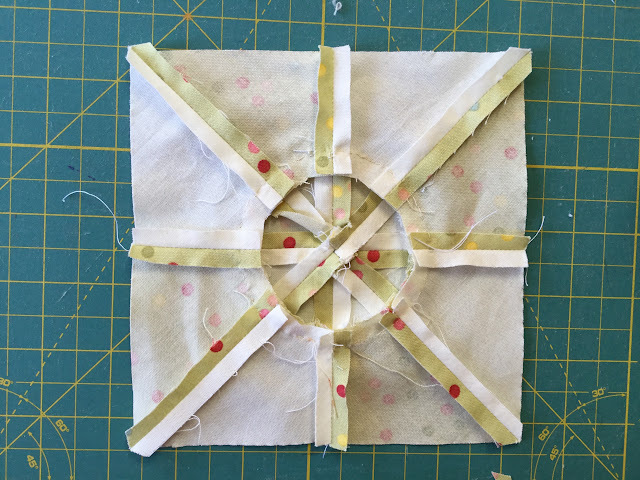 Then I removed the freezer paper and pressed well. 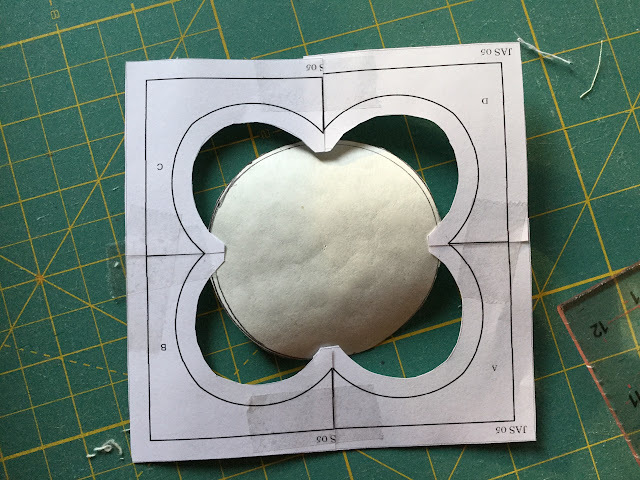 Then I traced the clover on to freezer paper. 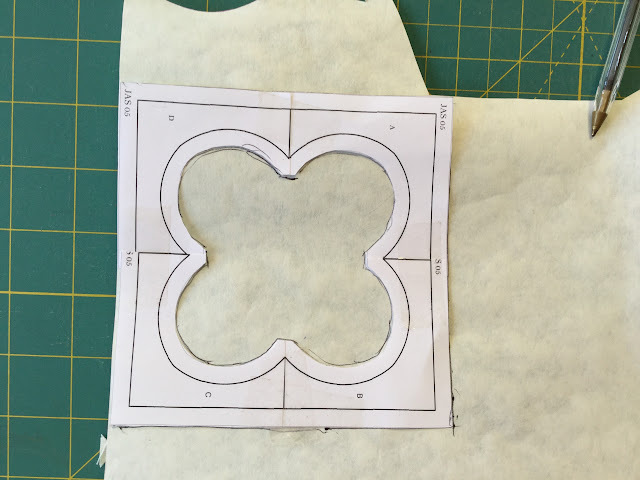 And cut the freezer paper adding 1/4 inch all around the shape. 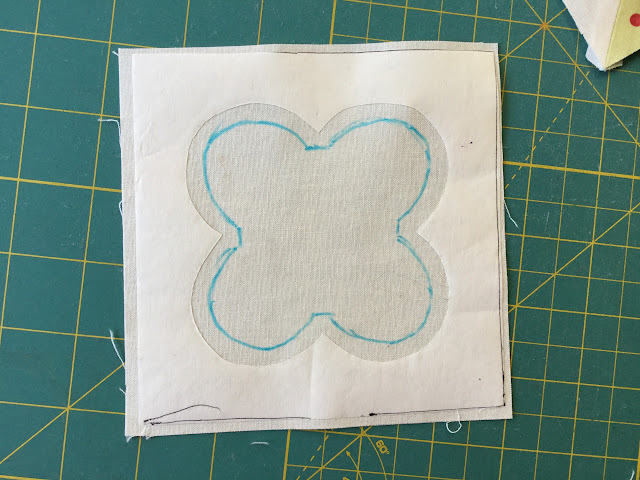 Then I cut along the blue line and made a few incisions around the curves. 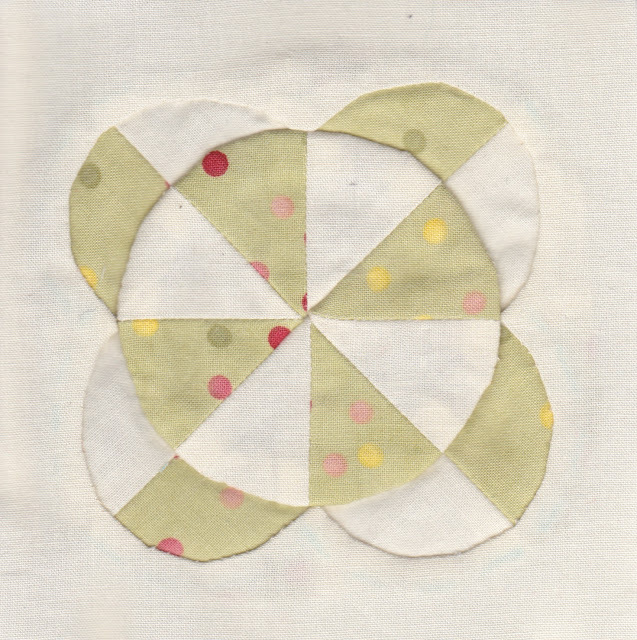 I then appliquéd the white shape to the background. 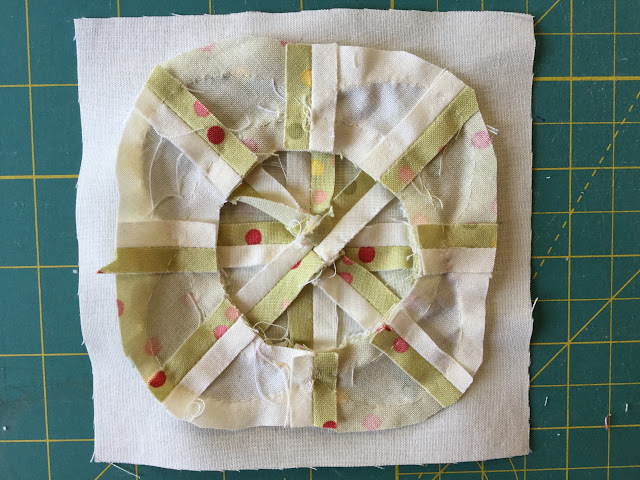 I trimmed off excess fabric.